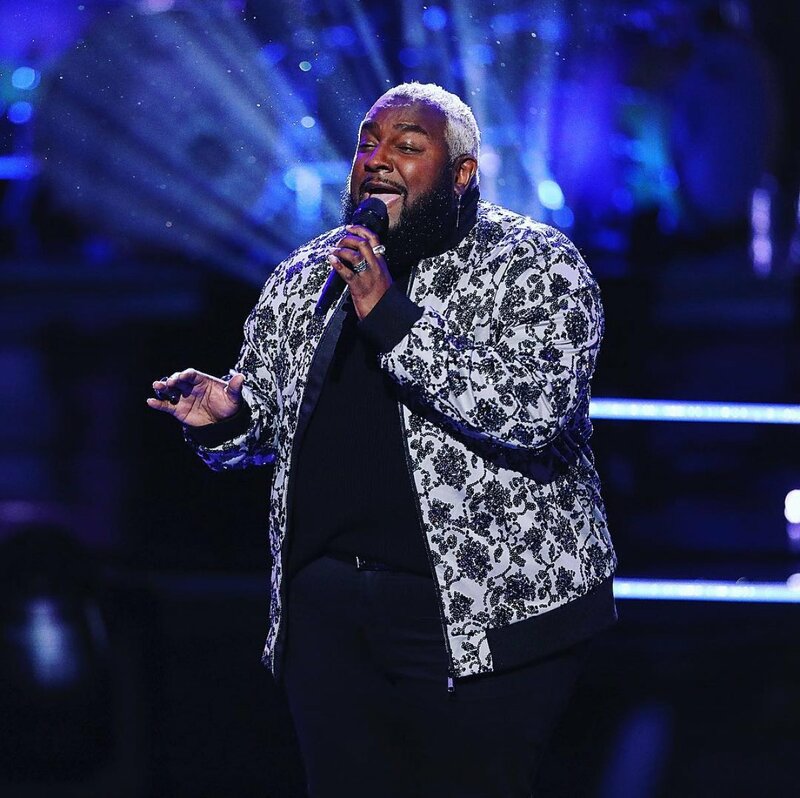 'The Voice' Blind Auditions wrap and Battles begin with Cody Ray Raymond, Michael Lee, Patrique Fortson and more! The Voice featured the end of its fifteenth-season Blind Auditions and the commencement of the Battle Round during Monday night's jam-packed two hour episode on NBC. Coaches Blake Shelton, Adam Levine, Jennifer Hudson and Kelly Clarkson were shown completing their teams for The Voice this season before the Battle Round began in which two artists are pitted against each other to sing a duet for only one spot on their coach's team going forward. The artists who won their Battles on Monday night's show were Cody Ray Raymond, a 26-year-old from Seattle, WA; Michael Lee, a 30-year-old from Fort Worth, TX; and Patrique Fortson, a 38-year-old from Atlanta, GA.
And the following two artists were stolen by other coaches after losing their respective Battles: Sandyredd, a 35-year-old from Chicago, IL, and Colton Smith, a 21-year-old from Albertville, AL. The night kicked off with the remaining Blind Auditions this season. Emily Hough, a 16-year-old from Petersburg, IL, performed "Big Yellow Taxi," and Adam, Jennifer And Blake all turned their chairs around for the young, crying artist. Blake called her voice "beautiful and angelic," saying she would stand out on his team. Adam said it's "unbelievable" what she does and Emily would complete her team. Jennifer noted she would allow Emily to explore her artistry and have a say in what she wants to do on the show, unlike the other "bossy" coaches. In the end, Emily opted to join "Team Adam." Josh Davis, a 20-year-old personal trainer from Cleveland, TN, then took the stage with "Too Good At Goodbyes," and both Kelly and Jennifer pressed their buttons. Kelly said she had a lot of female power on her team and she needs a man who can hang with them. Blake argued on behalf of Jennifer saying she's a triple threat and Oscar winner, but then Adam pointed out, "This is Kelly Clarkson. I don't really have to say more, but I will. She is a beast vocally." Josh decided to become a member of Kelly's team. Next up was Lisa Ramey, a 33-year-old from Brooklyn, NY, who sang "Beautiful Trauma," but she unfortunately did not make the cut. Katrina Cain was hoping to have some better luck. The 29-year-old from Denton, TX, canceled her honeymoon to audition for The Voice. The electro-pop singer chose to perform a stripped-down version of "Rhiannon" while playing the piano. Both Blake and Jennifer turned their chairs around for Katrina. Blake said it was "a mysterious" version of the song and it worked for him to hear the acoustics of her voice. Jennifer loved the rendition of her song as well and said she's made all types of records compared to Blake's country albums. Blake, however, argued he wins The Voice with artists from all types of musical genres. With that being said, Katrina picked Blake as her coach. Viewers were then introduced to Matt Johnson, a 26-year-old from Staunton, VA, who belted out "Never Too Much." Towards the end of his performance, Jennifer pressed her button to add Matt to her team, and he was thrilled. Matt revealed he had been auditioning for The Voice since Season 1. Jennifer said it was refreshing to hear such an iconic song. The Voice Battles then begun with two members from Kelly's team, who were afforded the opportunity to work with singer Thomas Rhett as their advisor. Sandyredd went up against Cody Ray. The pair sang a duet of "Cry To Me" by Solomon Burke. Sandyredd and Cody Ray received a standing ovation from all four coaches. It immediately became clear one of the artists was going to get stolen because they both had a moment and proved to be "masterful singers," according to Adam, who added the Battle was "miraculous." Blake called the pair "superheroes." Blake appreciated the vintage sound to Cody Ray's voice, but he admitted he would pick Sandyredd since there's no one that sounds like her. Jennifer noted they were both "beyond amazing." Kelly compared Cody Ray to Chris Stapleton but said Sandyredd is one of the best vocalists she's ever heard in her life. Kelly ultimately declared Cody Ray winner of the Battle, but then Adam, Jennifer And Blake all wanted to steal Sandyredd. Adam said he pushed first for Sandyredd in the Blinds and also pushed first to steal her. Adam said, working together, they could reach a place neither of them had ever reached before. Blake bragged he was decisive and named Sandyredd the winner of the Battle before Kelly announced her decision. And finally, Jennifer called her "an outstanding talent" and asked what she wants from a coach. "I know I couldn't go wrong, but I'm sorry, I'm going to take it home and I'm going with Jennifer," Sandyredd announced. The next Battle was on behalf of "Team Blake," and country singer Keith Urban served as the team advisor. Michael Lee faced off against Joey Green, a 35-year-old from Crowley, TX. Blake noted it was going to be his best Battle, and the guys performed Bonnie Raitt's "Thing Called Love." Blake compared Michael's intensity and Joey's laid-back nature. It was exciting but also heartbreaking for the coach, who ultimately named Michael the winner. Jennifer's team had a Battle next, and singer Halsey served as the advisor for Colton and Patrique. The artists were paired up to sing "God Gave Me You" by Blake Shelton, which was out of both singers' comfort zones. Kelly said if she had to choose she's go with Patrique but Colton sounded "rad." Adam noted it was a Battle of the dudes who have the best range and Patrique couldn't be with a better coach. Blake gushed about how Colton blew him away. In the end, Jennifer determined Patrique had won the Battle although they are both "superb vocalists" and "mind-blowing amazing." At the last minute, however, Blake decided to steal Colton for his own team because he had a lot of respect for him.